Rome is a city with a lot of history which makes the historical sites fascinating to visit but in my opinion it was also a very overwhelming city. I’m not sure if the high tourist season or the sweltering heat of the summer were to blame but the city felt a bit like a huge amusement park. I visited the big attractions like the Colosseum, the Vatican, the Trevi fountain etc…but I what I wanted to share and what was actually was one of my favorite parts of Rome was when we traveled across the river to the Trastevere to have dinner one night. 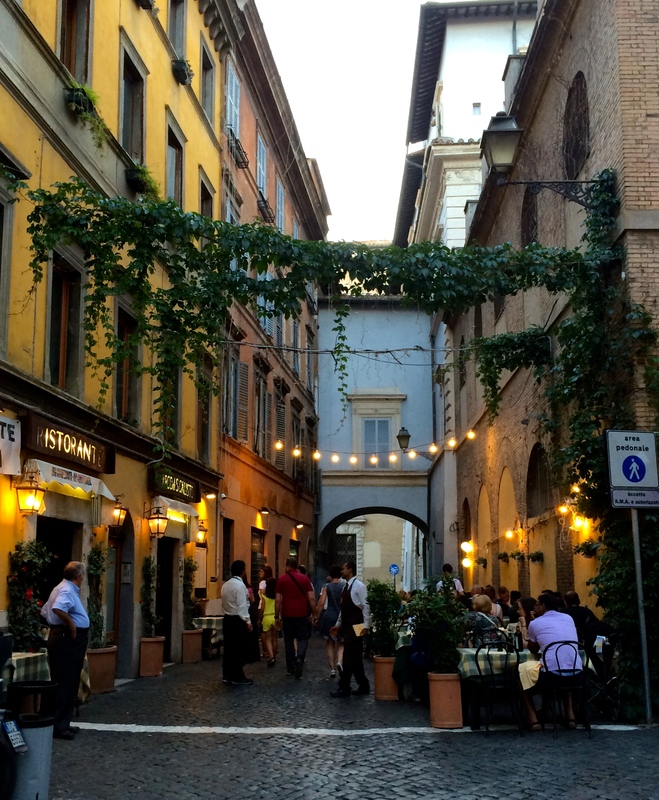 The Trastevere is a quaint neighborhood in Rome with narrow cobbled streets. There were less people, the streets were walkable, the restaurants were packed with people speaking Italian instead of English…we had finally found an area that was calm and welcoming. Visiting the Trastevere was the perfect way to relax after a full day of visiting all of Rome’s incredible sites. I so agree with the overwhelming part! At times I just wanted to put my face in a corner like a cat,it seemed like history was slapping me in the face everywhere I looked.